Do you like the look of a charmed bracelet? 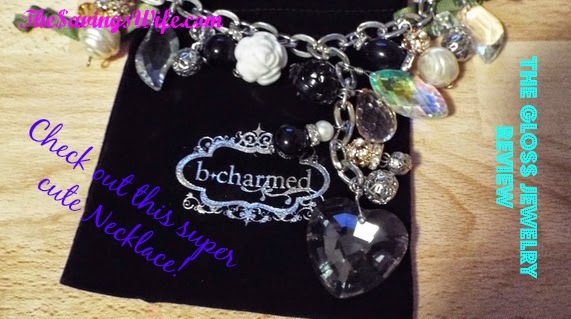 Check out this charmed necklace from B.Charmed from Gloss Jewelry. Just like a charmed bracelet this necklace is unique and matches with any color. I love this necklace. Gloss Jewelry loves making us women feel beautiful! They are not your typical Jewelry store. It's teh perfect place to find something special and affordable. They have unique, exquisite jewelry at a great price. They offer a great selection from designers all over the globe, at prices anyone can afford. Gloss Jewelry has many more charms, baubles, chains, clusters, frills, stamped metals, branded items, earrings, bracelets to choose from. This Necklace is the Chandelier Drop Necklace. It is perfect to wear over a sweater or to dress up a plain shirt. My favorite part is the roses. The smokey heart and other crystals are made to reflect light so they are sure to be noticed. Just look at the prism effect in the photo above. It also has gold colored parts so you can wear it with both gold and silver jewelry. The length is also adjustable so it lays perfect. You can also add your own frills and baubles.